Build tool cribs of any size or configuration. our tool crib partition systems are built of 840 woven high grade steel wires. The wire partitions panels come 1′ wide up to 10′ wide in one foot increments. The panels are 4′ and 5′ high and are stacked one on top of the other to build a tool crib either 8′, 10′ or 12′ high and can have a variety of doors. We have both hinged and sliding doors in stock available for 48 hour shipping. 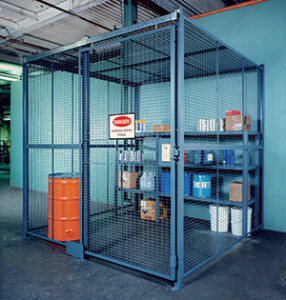 Security cages can be designed in custom sizes and configurations. Twenty standard sized panels 4′-0″ or 5′-0″ high, by 1′-0″ to 10′-0″ wide. Standard 3/8″ mounting hardware is the heaviest in the industry.